Too often we underestimate the importance of design, reducing it to colors and patterns, pretty pictures and fantasy homes. But there's more to it; and every so often we get reminded of the other side of things. The part where beautiful interiors become homes for real people. Where the right colors can change someone's day, and where patterns can represent the heritage and history of the people who live there. Jodi Querbach lives in the Bedford-Styuvesant neighborhood of Brooklyn, along with her husband Kemis and their five children. 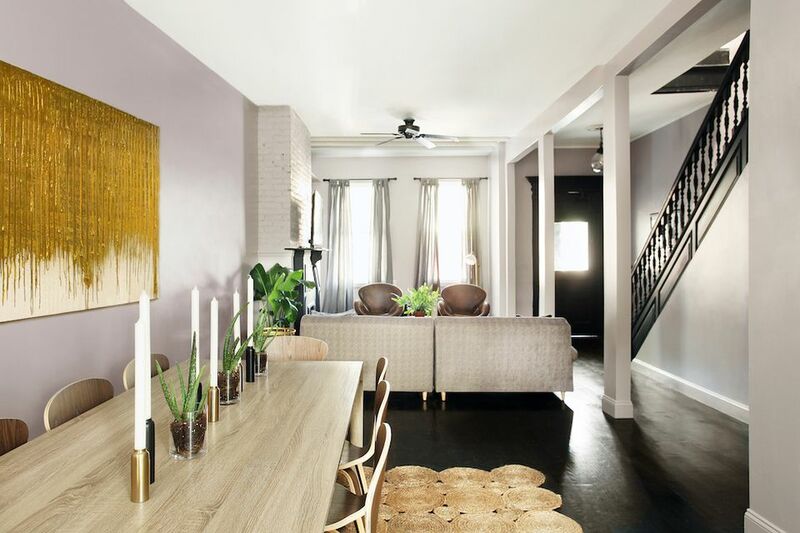 Their historic, 19th century brownstone was selected for a redesign by LOWE'S as part of their fall makeover program. The home was designed by Jeanine Hays and Bryan Mason of AphroChic with furniture from LOWE'S. To create the perfect backdrop the designers repainted the entire space in a special shade of gray with hints of lilac. As sunlight moves through the room throughout the day the wall color changes slightly from gray to purple, and even a slight shade of blue. The neutral tone creates a cool and calm interior that readily displays the colorful highlights placed throughout the room. The living room plan is open yet cozy, designed for time with a large family. A gray modular sofa is set across from a pair of matching petal side chairs to provide ample seating for all seven members of the family. The Moroccan Beni Ourain rug on the floor mirrors the neutral shade of the walls, while the natural tone of the chairs brings a touch of warmth to the cool interior. Plants on the table and floor pop with bright greens and bring a fresh, natural feel to the space. To give the historic home a touch of it's original splendor, AphroChic worked with contractor Will Johnson to design and create a brand new mantle. The visual center of the room, the mantle was painted black to match the color of the home's other original details. The dining room is a study in contrasts between the cool, industrial color of the walls and the warm, natural tones of the furniture. A long wooden dining table is attended by eight stylish dining chairs to ensure that there's room for everyone around the table. The painting, an original from Brooklyn-based artist Valincy-Jean Patelli adds a beautiful metallic shade to the open space that is echoed in the brass side tables of the living room. One of only two original pieces from the older design of the house, this classic hutch adds texture and depth to the dining room. The lamp and the potted plant that top the piece both echo elements from the dining table and the living room to create a cohesive look that flows along the entirety of the space. The home's other original piece, this wooden settee is an heirloom owned by Jodi. The bright metallic pillow and brass side table work with the wood to warm this space toward the rear of the dining area while continuing the overall flow of the space. To provide a useful storage solution for the family, the design team created another architectural feature which was built with help from a group of volunteers from the Brooklyn LOWE'S store. These built-in shelves were painted together with the mantle and walls to appear original to the space. A collection of vases and colorful, woven baskets in an assortment of styles and sizes were placed to bring texture and a well-traveled feel to the interior. The combination of the woven baskets with the moroccan rug, leather chairs and the rough brick of the walls help keep the space from feeling too cold and modern. As a finishing touch, the designers replaced the light overhanging the entrance with a modern version of an oil-rubbed bronze pendant. A final nod to the classic design of the home, a true representation of Brooklyn's unique architectural style.